Mullein (Verbascum thapsus) also known as great mullein, is a dramatic biennial herb of the Scrophulariaceae or figwort family. The family name of this European native may have derived from the word scrofula, a disease that is now understood to be a form of tuberculosis. 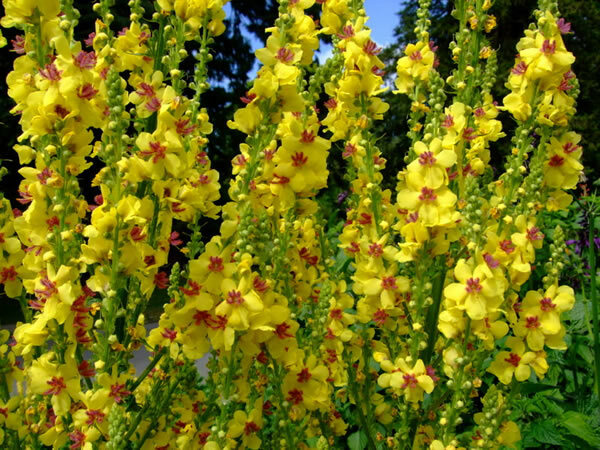 In Ireland mullein was widely cultivated as a remedy for tuberculosis. The seed is said to have arrived on the North American continent in the dirt used as ballast in old sailing vessels. At least five species of mullein have naturalized in North America. This sturdy and adaptive herb is found on roadsides, rocky and gravely banks, and in marginal areas throughout the world. It thrives in full sun and adapts well to arid conditions. The seeds of this hardy plant, particularly V. blattaria, may remain viable as long as 70 years. 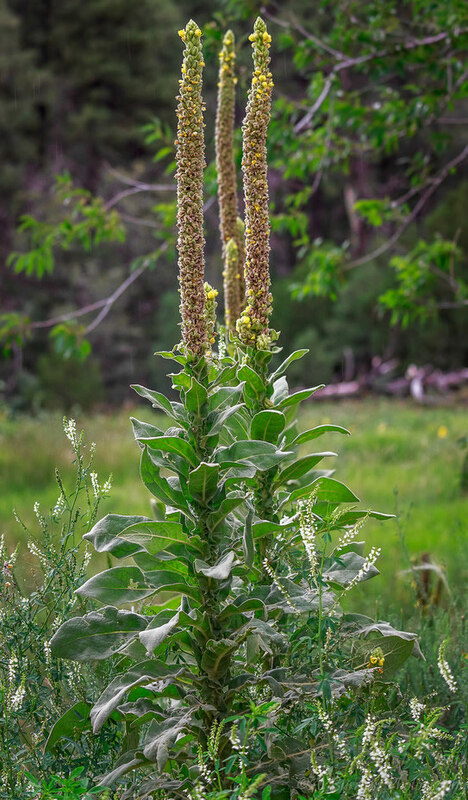 Mullein is known by many names reflecting the numerous medicinal and practical uses people have found for this beneficial wayside herb throughout its long association with human communities. Among the common names for mullein are flannel leaf, beggar’s blanket, velvet plant, feltwort, tinder plant, candlewick plant, witch’s candle, Aaron’s rod, lady’s foxglove, donkey’s ears, hag’s taper, candlewick plant, torches, and Quaker rouge. This last name was given because the leaves were sometimes used as a natural rouge rubbed vigorously on the cheeks to give a rosy glow, particularly among young women whose cultures have shunned cosmetics. Mullein has been known for centuries as Gordolobo in Mexico, where it was used by the Nahuatl and other indigenous cultures long before the coming of the conquistadors. Gordolobo is still sold in medicinal herbs stands throughout Mexico as a remedy for hemorrhoids and varicose veins as well as throat ailments. Like many plants of European origin, mullein was credited with power over witches and evil spirits. It was considered one of 23 important healing herbs in medieval Jewish medical practice. Mullein’s large stalk was used as a ceremonial torch as far back as ancient Rome. Stripped of its leaves and dipped in tallow, the cylindrical spike could hold a flame when carried aloft from place to place. One name for mullein is miner’s candle. During the 1849 California gold rush, the mine shafts were aglow with mullein torches carried by the prospectors. The leaves were used as tinder to start fires, or as a smudge, burned over the embers of Native American campfires. The smoke was inhaled to relieve pulmonary congestion. Mullein leaf, which some tribes called “big tobacco,” was mixed with nicotine leaf and smoked to relieve asthma. The leaves were boiled to make a hot poultice to treat gout and painful joints. Mullein’s thick, soft leaves lined the shoes of many common folk during the winter months to provide extra warmth. The leaves were also warmed over a hot rock and fitted to the foot to relieve fatigue. Figs were wrapped in the leaves to ripen and keep, and the flowers were used to add blonde highlights to the hair, or soaked in oil to make ear drops. Mullein’s branching, spindle-shaped root produces a low-lying basal rosette of broadly lance-shaped leaves in the first year of growth. Dense and downy white hairs give mullein’s light-green leaves a soft texture somewhat like the fine pile of velvet. These leaves winter over from the first year’s growth. They may reach 15-20 in (38-50 cm) in length and 8 in (20 cm) across. In its second season mullein transforms, reaching skyward with a single, pithy and fibrous stem stout enough hold itself erect when in full leaf. Small yellow, five-petaled blossoms each form a golden cup and encircle the upper few feet of the stem, opening randomly. The usually solitary stem, which may grow to 10 ft (3 m) high, is sometimes branched. The leaves clasp the stem, growing alternately, and are increasingly smaller toward the top of the stem, an arrangement that facilitates the flow of rain water to the roots. The flowers, leaves, and root of mullein have been used as healing remedies for centuries. 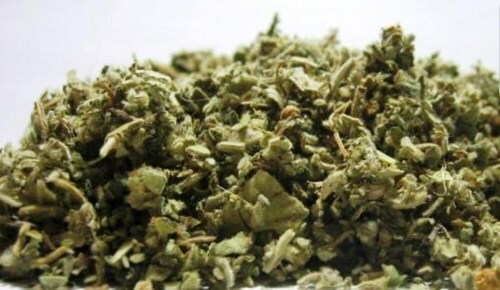 Mullein leaf and flower were listed as an official medicine in the United States National Formulary from 1916 to 1936. The plant contains mucilage, triterpene saponins, volatile oil, flavonoids, and bitter glycosides. The efficacy of these compounds in the quantity found in mullein is questioned by at least one researcher. However, in the realm of folk medicine, practiced for centuries, mullein is valued as a demulcent, emollient, antispasmodic, astringent, diuretic, vulnerary, and expectorant. Mullein is approved by the German Commission E, an advisory panel for herbal medicine, for treatment of respiratory catarrh. Studies have confirmed the anti-inflammatory action of mullein. Mullein tea, made from the flowers and leaf, is a beneficial remedy for bronchitis, sore throat, tonsillitis, dry coughs, and hoarseness. The flowers have bactericidal and sedative properties and are generally considered more medicinally potent than the leaves. Their bactericidal activity was confirmed by researchers at Clemson University, who reported in 2002 that mullein extracts are effective against several species of disease bacteria, including Staphylococcus aureus, Staphylococcus epidermidis, Escherichia coli, and Klebsiella pneumoniae. An oil extract of mullein flowers relieves earache, and the blossom tea can ease headache pain and promote sleep. The fresh leaves, traditionally boiled in milk and consumed daily, are an Irish folk remedy for tuberculosis. When this mixture is applied externally in poultice form, it is helpful in the treatment of boils, carbuncles, skin ulcers, chilblains, and hemorrhoids. Mullein leaves should be harvested before the herb is in blossom, leaving at least two thirds of the foliage on the plant. The flowers should be harvested just as they open. Blossoms are short-lived and drop easily from the plant. Roots are best harvested in the fall of the year. Leaves and blossoms should be dried in a single layer on paper-lined trays in a light, warm, and airy room out of direct sunlight. The medicinal properties of the flowers are diminished if they lose their color, so care should be taken in the drying process. Oil extraction: Combine one cup of mullein blossoms in one-half cup of olive oil in a glass double boiler over low flame. Heat slowly for about three hours. Strain with cheesecloth to remove all plant parts. Pour the oil into small, dark glass bottles, tightly sealed and clearly labeled for storage. A cold extraction can also be prepared. Cover flowers in olive oil in a glass container with a lid and set aside on a sunny windowsill to steep for seven to 10 days. Strain before storing in dark glass bottles. Infusion: Place 2 oz of finely cut fresh (less if dried) mullein leaf and blossom in a warmed glass container. Bring 2.5 cups of fresh, nonchlorinated water to the boiling point, add it to the herbs. Cover. Infuse the tea for about 10 minutes. Strain carefully, as mullein’s fine hairs are an irritant. The blossoms are sweeter to the taste than the leaf. The prepared tea will store for about two days in the refrigerator. Drink three cups a day. Syrup: Using fresh blossoms and leaves, prepare a strong infusion of mullein. Combine the infusion with a 50/50 mixture of honey and brown sugar. Use 24 oz of sweetener for each 2.5 cups of the herbal infusion. Heat mixture in a glass or enamel pot; stir frequently as the mixture thickens. Cool and pour into a clearly labeled glass bottles. Refrigerate for storage. Take 1 tsp of syrup three times a day, or every two hours if needed for chronic coughs. 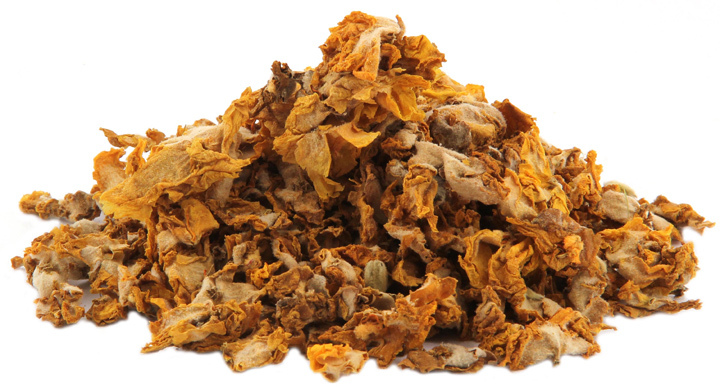 Although mullein is safe to use by itself, it is sometimes mixed with such other herbs as comfrey, echinacea, Irish moss, yarrow, garlic, or ginseng in a variety of commercial herbal preparations. The Food and Drug Administration (FDA) has issued consumer warnings about thirteen different herbal syrups, powders, capsules, or other dietary supplements containing mullein since 1999. Because the FDA classifies herbal preparations as dietary supplements and does not subject them to the approval process that prescription drugs must pass, consumers should purchase herbs and herbal products only from established manufacturers. People who would like to try mullein as an alternative remedy for sore throats might want to use the herb by itself first before trying herbal mixtures.